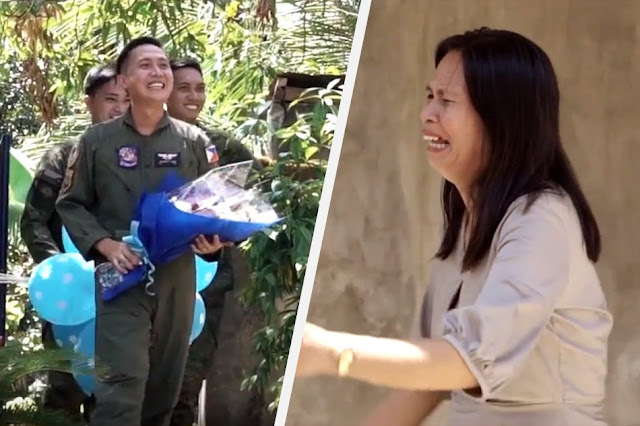 Despite the call of duty, three brothers who all serve in the Armed Forces of the Philippines made sure that their mother’s wish for her birthday will come true, for them to be together again in celebrating her natal day. We all can imagine what Milvina Garcia must be feeling, having her three sons in the military. It must be very stressful for the Garcia parents knowing that their three children are risking their lives for the service of the country. Their eldest son John Melvin is a combat pilot in the Philippine Air Force, while Gerson, the middle child, and the youngest, George Bernard are both serving in the Philippine Army. All of them brothers are part of the group of soldiers who fought in the Marawi siege. Because of their different assignments and their call of duty, it is very seldom for the brothers to come and visit their parents. Milvina Garcia knew all along that once sworn into soldiers, her sons will never be able to regularly come home, and was prepared for it. It seemed like she was giving her sons away for a greater good, for the service of the country, for the safety of the Filipinos. But still, something inside her fervently wished that she could at least see her 3 sons for her birthday. It is her birthday wish, but she knew it was too much to ask since her sons are all busy serving the country. Little did Milvina know that her wish will come true. She acknowledged the fact that ever since they became soldiers, it has become very difficult for them to gather in one roof. But not this time, the three soldiers made it a point to surprise her for her birthday, bringing flowers and balloons, but most importantly, bringing themselves. When Milvina Garcia saw them entering their home, she couldn’t suppress her feelings and cried out loud. She was so happy that her sons are all present for her birthday, and her sons are all too happy to grant their mother’s simple wish, for them to be together again on this very special day.